It involves a prolonged full pause held with a chin lock, until you experience the approach of fainting. Beginners may, indeed, faint. But experts remain seated upright, normally in the Lotus Posture, and attain a restful, pleasant suspension of consciousness. One breathes through both nostrils and may require several rounds and full pauses to attain his goal. Breathing in through both the nostrils. Raise your head and tilt a little back so that your eyes are looking towards the sky. Retain your breathe in (Antarkumbhaka). Keep yourself in this position as long as you can. Close your eyes and come back to position, breathing out slowly. Repeat all the steps above without break in between. Do this exercise daily at least 5 times. The mind becomes free of all the feelings and the performer experiences joy. Through this Pranayama, thoughts and resolution decreases in the mind, and a person experiences the feeling of non-existence. 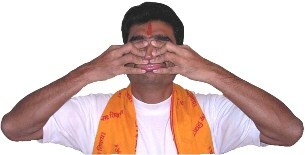 This exercise is recommended only for those already well advanced in the use of other breathing techniques.